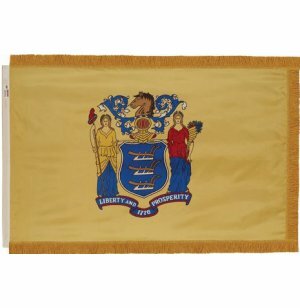 Promote Garden State pride with a regal New Jersey State Flag waving in your office, house of worship or school. 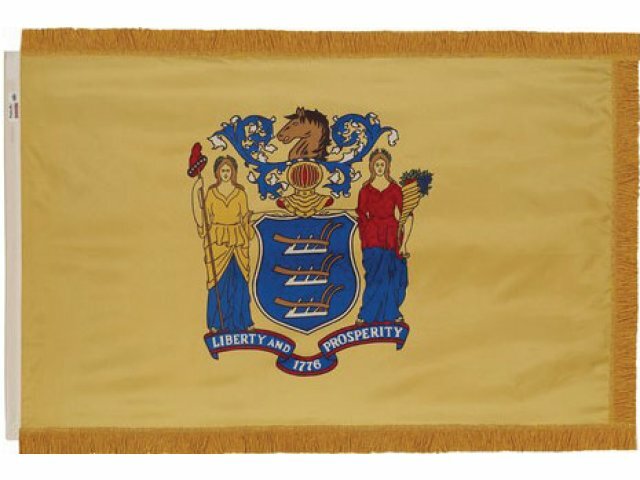 This durable indoor flag displays the New Jersey state emblem, colors and motto. It has special touches of elegance that draw attention to the details and intricate design. A golden fringe coordinates beautifully with the flag's colors. The pole hem makes it easy to slide your NJ state flag right onto a pole for assemblies and special events, and slide it right off again when you want to store or relocate your flag. This New Jersey State Flag is made from durable materials that will serve you well for the long term. Low-maintenance nylon maintains its beautiful colors and dries nicely. If you are planning on getting the most out of your purchase, this nylon NJ state flag is an excellent choice. State Pride: The New Jersey State Flag displays the intricate state emblem along with the state colors and motto. Easy Arrangement: A pole hem makes it easy to slide your flag on and off of a pole. Note: All other US state flags available. Call for information.